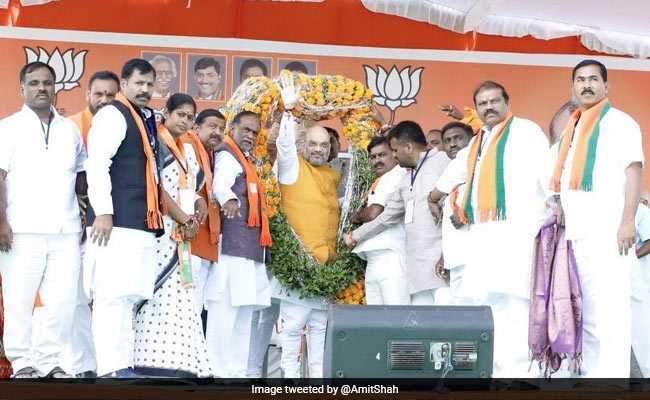 Telangana Election 2018: Addressing a public meeting at Parkal in Warangal district, Amit Shah appealed to people to vote for the BJP in Telangana polls scheduled on December 7, in order to take the state forward. Bharatiya Janata Party chief Amit Shah Sunday accused the Telangana government led by K Chandrashekar Rao of "failing" to keep its promise of appointing a Dalit chief minister and claimed that only the BJP, under the leadership of Prime Minister Narendra Modi, can ensure the state's development. He also hit out at Mr Rao for advancing the state polls, claiming that the chief minister did so as he was scared of the "Modi wave". Addressing a public meeting at Parkal in Warangal district, Amit Shah appealed to people to vote for the BJP in Telangana polls scheduled on December 7, in order to take the state forward. He said KCR (as Mr Rao is popularly known) failed to fulfil his promise of appointing a Dalit chief minister, and sought to know if he would now announce a Dalit as the chief ministerial candidate. Amit Shah also hit out at All India Majlis-e-Ittehadul Muslimeen (AIMIM) leader Akbaruddin Owaisi's claim that his party would be the "kingmaker" after the state election. "Do you want a government which is dependent on Owaisi and AIMIM? Neither the Congress nor KCR can provide such a governance, only the BJP can provide a government which is not dependent on Majlis," he said. Amit Shah also hit out at KCR for advancing the state polls, claiming that the chief minister did so as he was scared of the "Modi wave"
The assembly election in Telangana was expected along with the Lok Sabha election in May next year, but KCR advanced the polls and put the financial burden on people only because "he is scared of the 'Modi wave' and to promote his son and daughter for the chief minister's post," Amit Shah alleged. Attacking the Rao-led Telangana Rashtra Samiti (TRS) government in the state over its move to provide 12-per cent reservation to minorities, Mr Shah said the Constitution does not allow reservation based on religion and that it is "unconstitutional". "The BJP opposes religion-based reservations and will neither allow it nor allow others to grant it," he said. 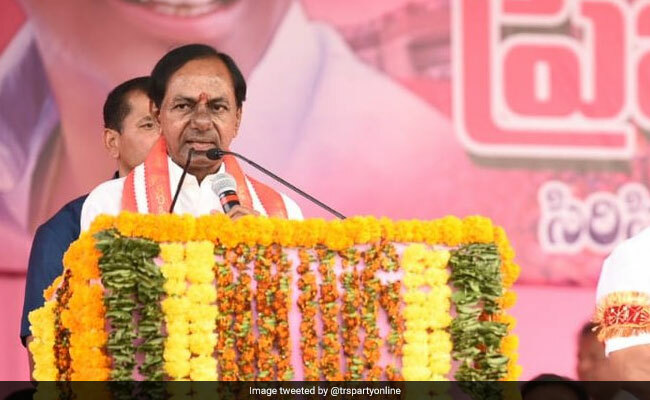 The senior BJP leader said the Modi government took up several works for Telangana's development and released over Rs 1.15 lakh crore to the state under the 14th Finance Commission, as against Rs 16,596 crore given by the UPA government under the 13th Finance Commission. "The central government gave over Rs 2.30 lakh crore for Telangana's development in the last four-and-a-half years. Under KCR's rule, a revenue surplus state (when Telangana was formed) has been pushed into a Rs 2 lakh crore debt," he said. Over 3,500 farmers in Telangana committed suicide under the TRS rule, Amit Shah claimed. And on the other hand, he added, the Modi government announced to provide a higher minimum support price to cultivators for their crops. Taking a dig at the alliance of parties, including the Congress and the Communist Party of India (CPI), formed in the state ahead of the polls, he said the Communist Party is on a decline across the world and the Congress is on a decline in India. "The Congress lost power in 14 states and the BJP is in power in 19 states," he pointed out. The BJP chief also slammed Mr Rao for not celebrating September 17 as 'Liberation Day' "out of fear of Owaisi". He said if the BJP comes to power in the state, it will celebrate Liberation Day in every village. The BJP-led government launched the 'Pradhan Mantri Jan Aarogya Yojana' for providing health insurance cover, but Mr Rao did not implement the scheme as "he is afraid that Modiji's popularity will further increase," Amit Shah said.